This was a rare occasion when the timing of things worked out perfectly for me. I had decided to take an extra day in returning from an annual long weekend trip with a few friends to the Eastern Sierra in order to visit a couple of Sierra Foothills wineries and vineyards, and I learned only a few days before my trip about an interesting tour of vineyards right in the area I would be visiting. This tour of several El Dorado County vineyards that grow Italian grape varieties was part of a special event informally called “California Meets Italy.” This was of particular interest to me since the small winery where I work part-time, Harrington Wines in San Francisco, has worked with over a dozen Italian grape varieties, starting with Nebbiolo in 2008. Although the limited time I had available meant that I was only able to participate in a part of the overall event, it turned out to be a very enjoyable and educational experience. The event was held over three days, from August 2-4. 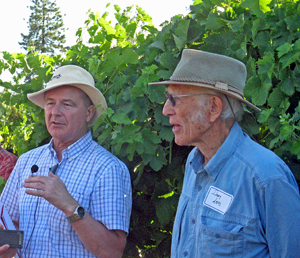 The first two days were vineyard tours – El Dorado County on Tuesday August 2, and Amador County on Wednesday August 3. Each vineyard stop was scheduled to feature a talk with the grower and with a winemaker who works with the fruit there as well as a discussion with Vittorino. 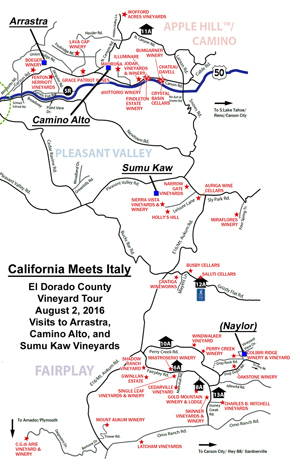 The El Dorado vineyard stops included Arrastra Vineyard (Aglianico), Camino Alto Vineyard (Fiano and Arneis), Sumu Kaw Vineyard (Nebbiolo), and Naylor Vineyard (Barbera and Dolcetto). The following day in Amador County included visits to Casino Mine Ranch (Vermentino), Cooper Vineyard (Barbera), Vino Noceto (Sangiovese and Barbera), and Shake Ridge Vineyard (Barbera, Primitivo, and Greco di Tufo). The event wrapped up with an evening seminar with Vittorino at the Terra d’Oro barrel room on Thursday August 4, to focus on the highlights of the vineyard tours and on the challenges and opportunities of growing and producing Italian varieties in the Sierra Foothills. While the two days of vineyard tours were intended to be for members of the El Dorado and Amador grapegrower and winery organizations, there turned out to be room for a handful of others to tag along as well, and I was fortunate to be included in that group. Many thanks to UCCE Central Sierra Farm Advisor Lynn Wunderlich and to El Dorado Wine Grape Growers Association President Elizabeth Standeven for inviting me to take part in the Tuesday tour of El Dorado vineyards. I had an appointment that I’d already set up for noon that day in the same area, and I was able to attend the first three of the four Tuesday vineyard visits. It was my first time visiting two of those three vineyards. 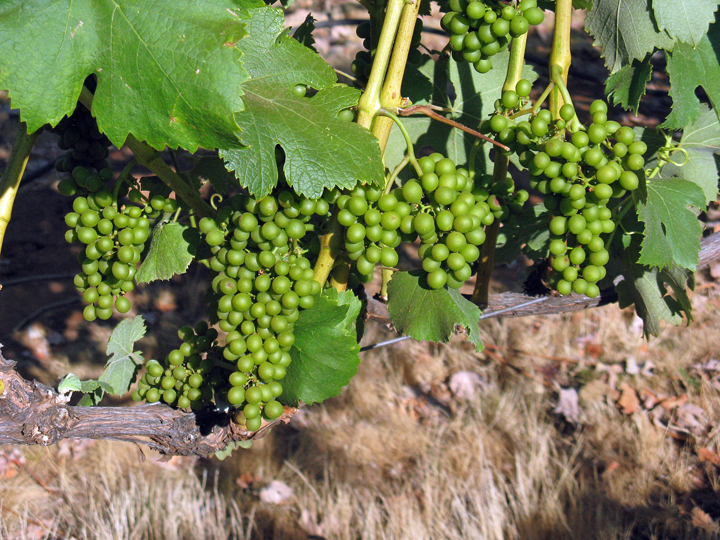 Wines from Italian grape varieties are not what most people associate with Sierra Foothills wineries – unless you consider Zinfandel (the distinctly California variant of Primitivo) as Italian. 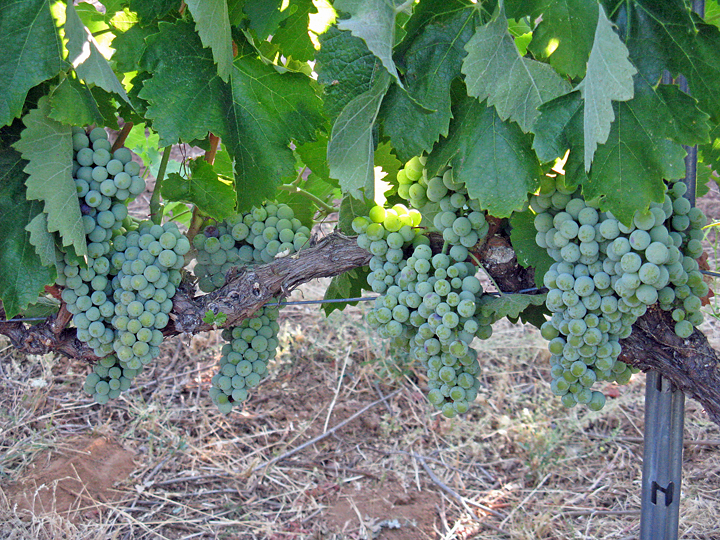 Barbera in particular has been very successful in the region, in both El Dorado and Amador counties. I’d say that much of California’s best Barbera comes from Amador County vineyards, and some of its best Sangiovese as well. El Dorado has probably had more acclaim in recent years for its Rhône-variety wines than its Italian ones, but there’s little question that Italian varieties have great potential, though they’re still a tiny percentage in the overall picture there. Out of over 2,400 acres of winegrapes grown in El Dorado County in 2015, Barbera took up the largest acreage of any Italian variety, at just 123 acres. But there were a total of 16 Italian grape varieties grown in the county for that year – Aglianico, Arneis, Barbera, Corvina, Dolcetto, Falanghina, Fiano, Lagrein, Montepulciano, Nebbiolo, Negroamaro, Primitivo, Refosco, Sagrantino, Sangiovese, and Vermentino – and there’s little doubt that we’ll see more planted there in the years to come. 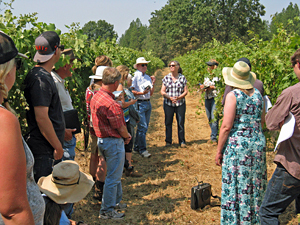 Just a note that some of the information below is a bit more technical in tone than my usual writing, since the tour was specifically geared toward other growers and winemakers rather than consumers. And even with my experience working at several wineries over the years, I won’t deny that some of the discussion at the vineyards was over my head! I made the drive over the Sierra from June Lake on Monday August 1, stopping in Calaveras County to visit Matthew Rorick of Forlorn Hope Wines at his vineyard and winery outside of Murphys. I’d originally planned to spend that night in Sutter Creek before continuing north to meet friends for lunch at Cedarville Vineyard in El Dorado’s Fair Play region on Tuesday. But with the vineyard tour now on my schedule – and the first stop at 7:30am – I changed plans and stayed in Placerville, only about a five-minute drive to the first vineyard. 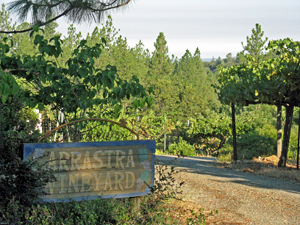 Our first stop of the day was at Arrastra Vineyard, located in the Apple Hill area just north of Placerville. Grower Doug Leisz was on hand, and he’d put out quite a welcoming spread of coffee and tea, muffins, and other tasty items to get us going for the day. Lynn started off the gathering by having everyone in the group introduce themselves, and she told us about how the idea for the California Meets Italy event had started about a year earlier when she’d met Vittorino at a viticulture conference in France. Vittorino then spoke briefly about the various projects he’s currently working on – as broad as cataloging over 600 grape varieties and as sharply focused as studying shatter in Dolcetto. After the introductions, Doug led us down a hill to his Aglianico vines. 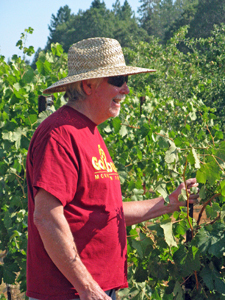 His 5.5-acre vineyard was first planted in 1983 and also includes Chardonnay, Merlot, and Charbono. He has five rows of Aglianico, two originally planted to that variety and three more that were grafted over from Merlot. Doug told us that Aglianico ripens late in the season, and that it has thin skin that is easily damaged. He said that the clusters go through veraison quickly (and late), and sure enough, they were still almost entirely green. He keeps the fruit well-shaded by the vine canopy as Aglianico doesn’t do well with too much sun exposure – Vittorino agreed that it is easily sunburned. Doug noted that Aglianico has both high acid and high tannin, so he tends to pick at higher brix – usually around 28 – to help bring down the acidity. Vittorino spoke to us about growing Aglianico in Italy. It’s grown in two regions of southern Italy – Campania and Basilicata (where the noted Aglianico del Vulture comes from). It’s typically grown on volcanic soil at elevations of around 600 meters (just under 2,000 feet) – the elevation at Arrastra is about 2,250 feet, with rocky topsoil and clay below. Vittorino noted that Aglianico typically has tight, compact clusters so that it’s critical to be aware of potential mildew and botrytis issues. In Italy, Aglianico is cane-pruned (as with most varieties there) and is trained on VSP trellising. Vittorino noted that the wire height tends to lower in Italy than at Arrastra. Controlling vigorous growth is another issue in the vineyard. Winemaker Marco Cappelli was scheduled to join us to talk about making Aglianico from Arrastra Vineyard, but unfortunately he had something come up at the last minute and couldn’t make it. Doug told us that their Aglianico is generally blended with about 10-15% Charbono. The Aglianico fruit is entirely destemmed, and Vittorino noted that this is always done in Italy as well. The variety tends to gain plenty of color and tannin extraction during fermentation. As we had a bit of extra time since Marco was unable to join us, Greg Boeger of Boeger Winery offered to show us his Sangiovese vines, conveniently located right next to Arrastra Vineyard through a gate. Boeger was the first winery founded in El Dorado County after Prohibition, in 1972. Greg told us that his Sangiovese is Clone 2 (Grosso), and Vittorino told us that there are quite a few other clones. He also said that it’s one of Italy’s most widely-planted varieties, seen everywhere except in Piemonte and Veneto. After our enjoyable early-morning visit to Doug at Arrastra Vineyard, it was time to walk back up the hill to our cars and then to head to our next vineyard stop not very far away. We drove east just a few miles to reach Camino Alto Vineyard, where we were greeted by grower Ron Mansfield and winemaker Hank Beckmeyer of La Clarine Farm. Ron is certainly the best-known grower in El Dorado County, and he’s worked with many noted vineyard owners and winemakers over the years. The group assembled among the Fiano vines in the lower part of the small vineyard. In addition to the Fiano and Arneis that we were there to see, Ron also grows Negroamaro and Aglianico there – just five rows each of the four varieties. Ron told us that Camino Alto has fairly deep volcanic soil (Aiken series) and that the site is at about 2,800-foot elevation. The vines are on VSP trellising with bilateral cordons, and Ron said that he typically is aggressive with leaf removal from the fruit zone. Ron and Hank noted that the crop was quite small last year but is looking more back to normal this year. An unusual feature of this vineyard is that all the vines were planted on their own roots rather than grafted to rootstock. Although somewhat risky – with higher potential for phylloxera infestation – the idea was to get the vines into production as quickly as possible (this year is fifth leaf). Ron did note that own-rooted vines can ultimately have longer productive lives than grafted ones, though. Vittorino told us that Fiano is grown in much the same area as Aglianico, mainly in Campania, and as with Aglianico it’s typically found at elevations of around 500-600 meters and planted in volcanic soil. Another similarity with Aglianico is that the vines tend to be vigorous. He noted that leaf removal in Italy is not as much as seen at Camino Alto, generally around 30% removal. We walked up the hill to the Arneis vines, and Vittorino said that this variety is recovering after once having very little remaining in the Langhe region of Piemonte. It has since been propagated from selected vines and has become well-known. 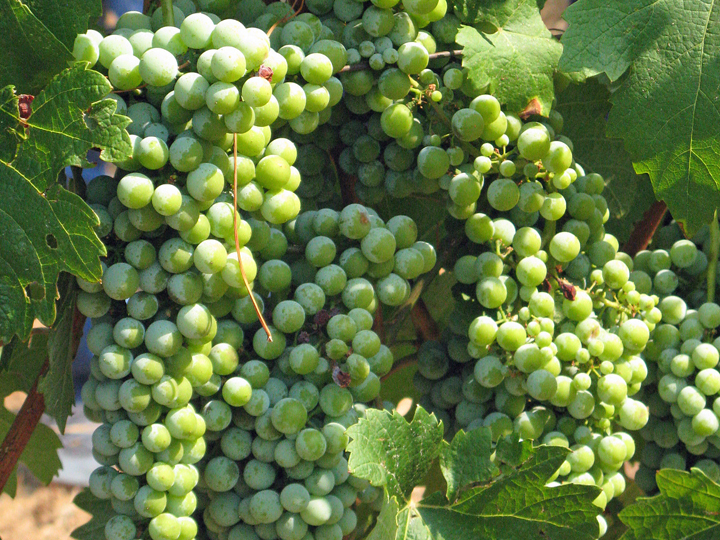 Arneis is typically planted in sandy soil in Italy, and it usually ripens around mid-season while Fiano comes in a little later. Fiano is noted as an aromatic variety with good acidity, while Arneis has lower acid but more body. Hank talked with us about his winemaking for the Fiano and Arneis – this is his third vintage working with the fruit from Camino Alto. He had intended to make a field blend, picked and pressed together – this can be a good way to balance the differing acidity in each variety. He was able to do this in 2014, with roughly 60% Fiano and 40% Arneis, whole-cluster pressed with no skin contact, and a fermentation that took six months. Vittorino noted that neither variety is blended in Italy. With the small crop in 2015 – the Arneis yielded only 300 pounds of fruit – Hank made a varietal Fiano and blended the Arneis into another wine. He noted that the yield from pressing these varieties tends to be low – for example, he got only 250 gallons of juice from 2.2 tons of fruit. The morning was getting warmer and by the end of our visit to Camino Alto, many among the group were searching for whatever shade they could find among the vines. So although we’d had an enjoyable time, getting back into our air-conditioned cars and trucks didn’t seem like a bad idea. It was a longer drive to our next stop, and many of us followed one another down the road. I’d been to Sumu Kaw Vineyard before (we’ve gotten several varieties from there at Harrington Wines the past couple of years) and knew the route well. It follows a rather narrow and curvy road that dips down to the Cosumnes River and then climbs back up toward the Pleasant Valley area between Placerville and the Fair Play region a few miles farther south. Eventually we continued along a dirt road, passing through a few gates that had been opened for us, and arrived at Sumu Kaw Vineyard. 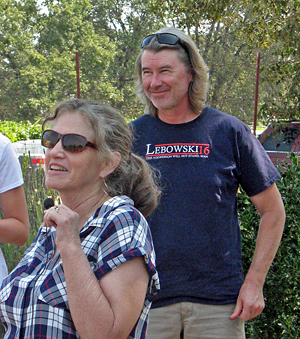 Vineyard owners David and Sheila Bush welcomed us, and led us to a gathering spot under the shade of a large tree – we were all thankful for that as the day grew hotter! Sheila farms the vineyard, and the Bush family – owners of Madroña Vineyards in the Apple Hill area – also owns another vineyard (Enyé Vineyard) we’d passed through along the dirt road to Sumu Kaw. The vineyard is at 3,000-foot elevation and was planted in 1994 and 1997. There are about 24 acres planted with 15 varieties, many of those Rhône and Portuguese varieties, plus the Nebbiolo that we’d come to see (that was planted in 1997). Sheila told us that the vineyard has used no herbicides and only organic sprays for about five years. Due to the typical early budbreak of Nebbiolo, frost can be an issue so they leave kicker canes to delay budding. The vines are cane-pruned and tend to be vigorous, despite being on devigorating 101-14 rootstock. Sheila noted that the canes are thin and fragile, easily broken, and Vittorino said that this is typical of Nebbiolo in Italy as well. Despite early budbreak, the variety ripens late, usually anywhere from mid-September to early October at Sumu Kaw. As with all the growers we talked with during our visits, Sheila mentioned that there has been more mildew and botrytis pressure than usual this year. Vittorino talked with us about Nebbiolo’s well-known home in the Langhe (Barolo and Barbaresco) and Roero regions of Piemonte in northern Italy, as well as Gattinara, Valtellina in Lombardy, and elsewhere. He said that the vines for higher-quality Nebbiolo are always cane-pruned, and that the soil ranges from sandy to deep clay depending on the specific location. Nebbiolo wines are noted both for lack of color stability and for being very tannic. Vittorino noted that blending with other varieties (such as Barbera) has long been done in Italy to help deepen the color, though this is no longer permitted in some areas such as Barolo. Traditionally, the wines have long maceration and are aged for 3-4 years in larger (1,000+ liter) wood vessels called botti. Vittorino said that some producers switched to smaller 225-liter barriques for aging but a number of them have gone back to larger vessels such as puncheons or botti. Madroña Vineyard produces a varietal Nebbiolo from Sumu Kaw Vineyard, and assistant winemaker Ryan Wright was on hand to talk with us about the winemaking there. He said that they had tried various methods during fermentation and aging. Pumpovers and slightly extended maceration time led to overly tannic wines, while trying out even longer macerations resulted in diminished aromatics. A long cold soak helped with aromatics but sacrificed color, and bleeding off juice prior to fermentation didn’t help with color – though it resulted in a nice rosé! Fining helped tame the tannins but also stripped fruit and subtleties from the wine. Eventually they settled on a 3-4 day cold soak, pressing a little sweet, blending in 10-20% Barbera, and aging for 10-16 months in older puncheons. Ryan noted that treating the wine like they would for a Pinot Noir helped keep the tannin in check while preserving the aromatics. Since Hank Beckmeyer was also there, he spoke a little about a wine he makes using the Sumu Kaw Nebbiolo. He takes a different approach to make the La Clarine Farm “Piedi Grandi” – a blend of Nebbiolo and Mourvèdre (and sometimes a bit of Syrah). He found that the Mourvèdre helped fill in the mid-palate of the Nebbiolo as well as giving the wine more color. Eventually it was time for everyone to take off from Sumu Kaw Vineyard. The group continued on to their next stop at Naylor Vineyard in the Fair Play appellation of southern El Dorado County, while I needed to head to my previously-scheduled appointment at Cedarville Vineyard in the same area. It would have been fun if I’d had time to come along for the final tour visit of the day at Naylor Vineyard to look at the Dolcetto and Barbera vines, especially since following that there was a lunch and tasting of wines sourced from all of the day’s vineyards. However, I made the drive to Cedarville Vineyard, where I met my friends Jane and Chris from Sacramento for a visit with Cedarville owners and winemakers Jonathan Lachs and Susan Marks. 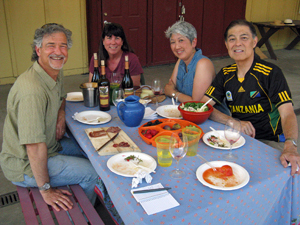 We had a brief tour of the vineyard and tasting of new releases (the 2014 Grenache and 2013 “Rules of Fair Play” Zinfandel / Petite Sirah blend were standouts), then enjoyed a picnic lunch on the covered crushpad. Thanks to everyone involved in arranging this unique vineyard tour. Lynn Wunderlich and Elizabeth Standeven in particular did an outstanding job of organizing the El Dorado tour, down to key details such as making sure that everyone in the group had detailed driving directions to each vineyard and setting out signs at critical points along the route. I have to point out that it’s rare on a tour such as this one that it stays pretty much on schedule, but everyone did a terrific job of keeping things on track, and there was still plenty of time for very informative discussions during each of the vineyard stops. Many thanks to all the growers and winemakers we visited – it was very generous of all of them to take their time to meet with us, and we learned a great deal from them about the various Italian grape varieties in their vineyards. And of course a special thank you to Dr. Vittorino Novello for sharing his knowledge and experience with all of us during his visit to the Sierra Foothills. 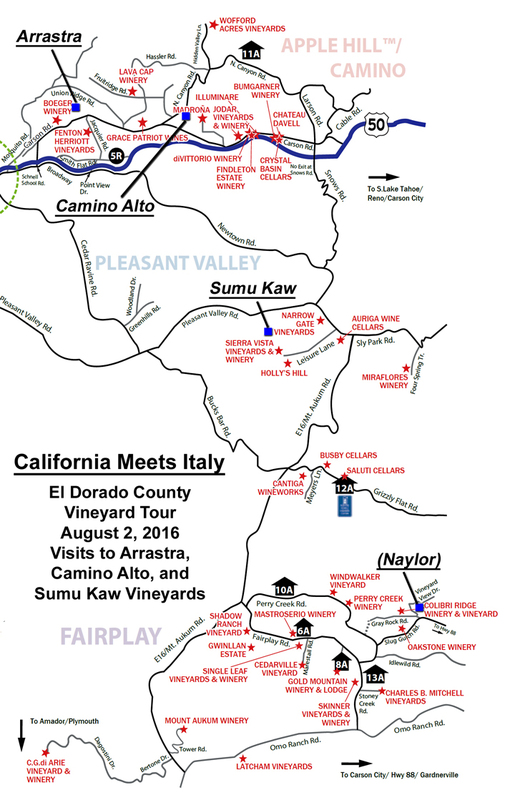 This was a memorable experience for me – a unique opportunity to learn so much about growing Italian grape varieties in El Dorado County and making wine from them. It was wonderful to meet so many knowledgeable people – not only Vittorino and the growers and winemakers at each vineyard stop, but also the other participants who came along on the tour. As always, thanks to everyone that we visited for being so generous with their time and their wine!